Bea Johnson has just announced details of her 9th speaking tour in which she will visit 10 European countries including a visit to Cork where she will share her inspirational story of change at a talk in Rochestown Park Hotel on 27 September at 8.00pm. The event is open to all, tickets are 15 Euro and any profits generated from ticket sales will be donated to CHASE to cover Oral Hearing bills. 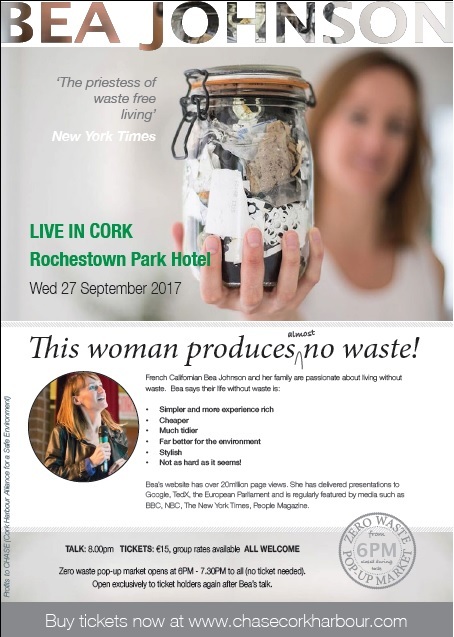 The Cork event is being hosted by CHASE and Cobh Zero Waste and will feature a Zero Waste popup market which will be open to ticket holder and non-ticket holders. A zero-waste popup market will operate before the talk, and give attendees and those interested in package free shopping an opportunity to purchase some home and food items free of packaging. The demand for package free shopping is on the increase due to pay-by-weight bin charges and an increased awareness of the environmental issues associated with plastic and other excess packaging. After the talk. The market will re-open exclusively for ticket holders when talk concludes. Home Care: Toilet cleaner, all purpose cleaner, washup liquid, laundry liquid and fabric conditioner dispensed by volume direct to customers own refill bottle (any bottle). Personal Care: items including unpackaged soap and liquid shampoo and conditioner into customers containers and bottles. Food: A range of beans, pulses and rice will be on sale loose by weight to scoop into your containers or use paper bags available.